So you’re planning for a new horse barn but aren’t quite ready to pull the trigger. You can find ways to help make your existing barn work for you–because why spend any more money investing in your old barn when a new one is ‘on the horizon’? Who knows, you might find that these horse barn hacks can be ideas for your new barn too. Consider purchasing an over-the-door hanging organizer for tools like racks and shovels. These organizers aren’t just made for hanging coats in a hallway or towels after showering. And better yet, there are no installation instructions! If you’re having issues with dust accumulating on your tack, you can use a simple product to help! Purchase a clear shower curtain to fix above your bridle hooks. This allows your horse tack to remain dust-free and allows you to still see your gear. Instead of messing around with hoses that get tangled between horses’ legs–potentially causing harm, consider purchasing an overhead carwash boom. You only deal with the amount of hose you need to get around the horse without stepping around the excess that lays on the ground. When you’re washing away horsehair, manure and other debris in the bathing area, try putting a screen under the drain. You can easily cut a piece of mesh from an old window screen or buy a roll from a local store. All you need to do is lift the drain and clean the screen off. 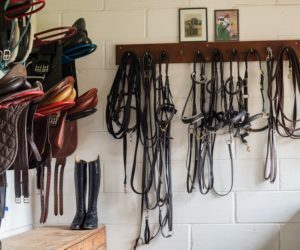 Are you running out of space on the wall of your tack room? Well, here’s a way you can create central, vertical storage in a snap! With 2 or more vertical storage units (like book shelves), place them in the center of the room and push together back-to-back or in a triangular shape if you are using 3 units. You’ve now created temporary storage space for little cost. You might be doing some of these already and if you are, hooray to you, cost-conscious warrior! There are always ways to accomplish things on a budget and we hope a few of these hacks for horse barns gave you new ideas!